Notes: The oldest cemetery in the North East of England, in use from about the 1770's or 80’s until 1856. An article in the Jewish Chronicle 21 Jun 1861 describes the origins of the Jews of Sunderland. Mr Lottinga described the history stating that in the 1777, two brothers whose family name was Samuel were the first Jewish residents in the town or in the North of England. Two more families joined them, Cohen and Davis. A few years later a room was rented in Wine Street where they worshiped. In 1790 Hart Samuel sent his daughter Elizabeth to family in Amsterdam to engage a minister. Jacob Joseph accepted and not only became the congregation's Rabbi he also married Miss Samuel. It has been estimated that up to 500 people may have been buried there. 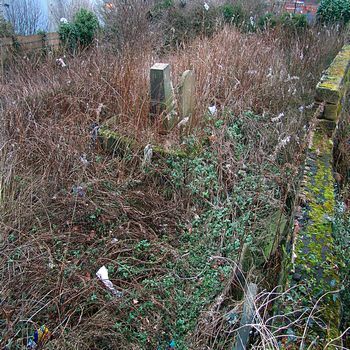 The site is a very private burial site, situated on a hill top between a slag heap and a factory. Enclosed by walls and in a somewhat in accessible position it has deteriorated over the years and now 'at risk'. Our thanks to Shaun http://www.flickr.com/photos/theunderstudy/ who waded through nettles to take these photos!